I’ll probably say it again before I have finished, but I’d argue that this is the best time in the history of the world to be a writer. I know – pretty grandiose. Let me explain. When I started writing at the end of the 1990s, if I wanted to get my writing out to readers I only really had one path that was open to me. Once I had finished my manuscript, I would send the first three chapters and a covering letter to one of the dozens of literary agencies that accepted unsolicited submissions. Let’s assume that the agent liked my writing enough to represent me and my book. The next step would be for them to send the book to a list of potential editors with an exhortation that they should publish me. …and eventually would be published eighteen months or two years hence. Once published, it would duke it out for the attention of readers with all of the dozens of other books that were released that week. If I received a small advance—most likely—the book might get a small promotional budget. It might get a slot on one of the tables of the front of the book store (those are paid for, by the way). But, most likely, it would be put into a section of the store, spine out, and that would be that. Well, let’s assume you get an advance. Maybe it’s $20,000 for a book (you’re doing well at that level). Between 10% and 15% of that will go to your agent, and the rest will probably be paid to you in installments: one on signature of the deal, one third on hardback or trade paperback publication, one on mass market paperback publication. You’re probably looking at three payments of around $6,000 each (before tax) spread out over eighteen months. In the unlikely event that you sell enough books to pay back the advance, you’ll be looking at a royalty per sale of around 10%. On a $10 book, you’ll be getting $1. Your agent will take, say, 15% of that leaving you with around 85c per copy sold. You need to sell a LOT of books in order to make that work financially. And people wonder why authors are having to take jobs to pay the rent. Because that’s precisely what happened to me. My first two books were published by a big publisher. I had a great agent and a great editor, and the staff I worked with were really excellent. I was taken out and given a great deal of red wine. I really did have a very enjoyable time. I was ecstatic to sign my publishing contracts, but I thought – naïve as I was – that in return for giving up around 85% of the cover price, my books would be treated to a decent promotional budget. I wasn’t looking for billboards or ads on the sides of London buses. Just… well, something. I’m still not entirely sure what was done to push the books. I was given a box of them and encouraged to get reviews. I remember thinking, as I trekked back and forth to the post office: wasn’t my publisher supposed to do that for me? I was looking forward to seeing the covers – but they turned out utterly miserable. I probably could have done better myself. They sold pitifully. They were shelved incorrectly and in what might charitably be characterised as unappealing real estate (either at the feet of the browsing customers or so high that shorter readers would need a ladder to liberate them). Like any newly published author, I rearranged the shelves so that my titles were at eye level, but – damn them! – the efficient staff returned them to their rightful places before too long. Eventually, with no promotion and no marketing, lost in unvisited bookshelves with no reviews and what seemed like disinterest from my publisher, my first two books sank without trace and, most likely, ended up in landfill somewhere. Things started to go downhill very fast indeed. My publisher dropped me. My agent dropped me, and I couldn’t find another. With my dreams of making a living from my stories raised up and then dashed, I gave up. I stopped writing completely and concentrated on my day job of being a lawyer. The Kindle arrived and everything changed. A friend tipped me off that it was now possible for authors to publish their own books, without needing an agent or a publisher. He was getting emails from readers who had enjoyed his books and wanted to discuss them with him. He was actually making money, too. This seemed revolutionary after my first sojourn into publishing. And so I got back into the game. I published my first indie title in 2012 and I’ve never looked back since. The results have been life-changing. 1 I quit my job. 2 I have had thousands of reviews. 3 I’ve sold more than a million copies of my books. 4 I’ve made seven figures from the silly little stories in my head. Just as important, I get emails and messages every single day from readers all around the world telling me how much they love my books. It really is like I’ve died and gone to heaven. And that’s why this is the first of the things I wish I had known when I wrote my first book: “Indie” is not a dirty word. Just looking at it in financial terms puts the benefits of going indie against going the traditional route in stark relief. The self publishing platforms will give you up to 70% of the price of the ebook. I tend to price my books at around the $5 mark. That means that I’m receiving around $3.50 for every book that I sell. Compare that to the 85c I stand to make per copy on a traditional deal (if I’ve paid off my advance). Independent publishing suddenly looks a whole lot more interesting. Books don’t sell themselves, and authors who aren’t prepared to step out of their writing dens to get busy with the base matters of promotion and marketing would be better advised to seek out a deal whereby that activity can be handled by someone else. At the end of the day, I’m agnostic about the form the book takes. It could be a dead tree or a collection of electrons; it makes no difference to me at all. The most important thing is the story, and a book or an ebook is just the means of transmitting that story from writer to reader. I think it is unlikely that ebooks will lead to the end of the printed book. On the other hand, I don’t think we are anywhere near the level of penetration that ebooks will eventually garner. The most important thing that a new author can do is to build a mailing list. It’s inexpensive and easy to set up and it opens up so many opportunities that you would be remiss in putting it off. As much as I love the platforms that sell my books, they are never going to provide me with the email addresses of my readers. There are reasons for that – proprietary and legal – and there is no point pretending otherwise. And that leaves us in a slightly precarious position. If Amazon (or the other retailers) go bust, or change their business models, how can we get our readers to follow us elsewhere? Facebook and other social media channels already charge us to reach our followers – what if they change their algorithms (again) and make it even more difficult? There are a lot of “what ifs”. And it’s important to insulate ourselves against decisions and events that are outside of our control. The best way to do that is to establish a list of our readers that we own and control. A list that we can rely upon when we have a message that we want to communicate. An email mailing list is the single best way to do that, and the most important asset that an author can have. WHY ELSE SHOULD WE BUILD A LIST? 1 Told my readers that I had a new book out (and promptly saw them launch it into the top #100 in the whole of the Amazon store). 2 Recruited readers to my advance team and had them spot errors that had slipped through my editorial process. 3 Found expert readers who were able to help me correct factual errors that I’d made (for example, ballistics experts who correct my shocking lack of knowledge when it comes to the weapons that John Milton uses). 4 Put out a call for my readers to consider voting for me for a UK thriller award. 5 Build a lookalike audience for Facebook advertising. 6 Asked those readers who had read one of my books to consider leaving an honest review so that I could increase the odds of landing an influential promotion (and duly added fifty reviews in less than 24 hours). SO, HOW DO WE BUILD A LIST? There are two ways: manual and automatic. When I started out, I did everything on a shoestring. It wasn’t because I was trying to save money, but because I didn’t know any better. And you can build your list this way. For example, you could leave your email address in the back of your books and on your product pages and invite your readers to reply if they would like to be added to your list. Emails will come in and, when they do, you copy the email address and paste it into a spreadsheet. You might have offered something in exchange for the readers signing up (a free book is usually effective), so you’ll have to email them back with whatever you are giving away, too. I did this for a few months at the start of my career and it worked, up to a point. The problem was that it soon became onerous when I was getting five or ten signups a day. The more serious problem is that when you want to email your list in bulk, you’ll have to use the bcc field in your email client, and that’s not really what it was designed to do. More serious than that is the likelihood that your email account will be flagged as a potential source of spam, running the risk that you account will be closed. Which brings me to the way of running a list that I recommend: doing it automatically, without you having to lift a finger. First of all, you’ll need an email list service provider. There are loads, catering to authors at various levels of their career with various requirements. The service that I recommend for beginners is MailChimp. It’s big and robust, easy to set up and use, and free until you have 2,000 subscribers (by which time you’ll be making more than enough to fund the small monthly payments). 4 All of your social channels. It’ll increase the flow of signups to your list if you offer something in return for an email address. It could be a novel, or a novella, but it could also be something smaller (I’ve used a PDF character sheet before with some success). This isn’t a requirement, but, in my experience, it is much easier to get momentum behind a writing career if you write in series. There are plenty of reasons why that is the case. First, you’ll be able to write more quickly if you have a world and characters established that you can then return to again and again. When I am writing a new Milton or Rose book, all I have to do is think of an interesting plot that my characters can be involved in and let them get on with it. Writing fast isn’t a prerequisite for success but, again, it’ll help. And writing in series is a good way to produce books quickly. Second, if you write the kind of series where the character becomes the hook, you’ll start to see what writers refer to as “read-through”. In other words, if a hundred readers read the first book in the series, perhaps sixty will go on to read the second book and fifty will read the third, etc. That is “organic”, in the sense that you don’t have to pay anything for it to happen. Third, you’ll establish a brand on the retailers. Series books will typically share plenty of characteristics when it comes to cover design. If you go to Amazon and search for my name, you’ll be presented with two of my series – most likely the John Milton and Isabella Rose books. Each of those series has its own distinct visual style, and makes it obvious to the browsing reader that I’m a serious author with plenty of books behind me. Fourth, some readers prefer to read series. They like to know that, if they like the first book that they read, there will be others that they can enjoy afterwards. Fifth, you can put series ‘box sets’ together and then advertise them. My highest selling items are sets of books. For example, I sell the first three books in the Milton series and, because I can charge more for that set (around $6.99 usually), the increased revenue can mean that my advertising doesn’t have to convert (i.e. make sales) at such a fast rate to still maintain a decent margin. Digital entrepreneurs (note: that’s what you are!) have a wide range of advertising options available to them to enable them to make people aware of them and whatever it is that they are selling. Selling a book is the same as selling any other kind of digital product, and the ads that work for, say, online courses or software will work for authors, too. I’m best known in the author community for my work on teaching others how to use social media ads to find readers and sell books. I’ve been using those ads for several years, and spent $400,000 between 2015 and 2017. Two things to say about that: first, you don’t have to have a big ad spend to make the ads work; and, second, that expenditure returned more than 100%, and so was very profitable. The power of these kinds of ads is incredible, and getting better all the time. Comparing them to the traditional ads that many new traditionally published authors consider as a rite of passage is amusing. Let’s take a romance book that would appeal to the readers of Nora Roberts as an example. We will consider a billboard ad placed at a railway station. Of all the people who see that ad, around 50% (the men) can be discounted immediately. Of the remaining 50%, a good percentage won’t be interested in romance. Of the remainder, plenty will have no interest in Nora Roberts. Eventually, as we slice and dice the original number to those who might be interested, we’ve probably lost almost all of the audience who saw the ad. And the amount paid to the owner of the advertising platform will be based on potential eyeballs, including all those who would never have been interested in the product. Let’s compare that to what we can do on Facebook. I can target my ad so that it is seen by women, perhaps between the ages of 40 and 60, who have indicated that they read on a digital device and that they love the work of Nora Roberts. Another example: I can send laser-targeted ads to readers who I know enjoy Lee Child’s Jack Reacher books. I also know that my typical reader is male and between the age of 35 and 65. Knowing all that, I can write my copy to take that into account. A third example: I advertise my training programs and books on Facebook to writers who I am very confident are interesting in writing and self-publishing their work. Can you see the power of these advertising platforms? I’m not even going to mention retargeting ads (the ads that automatically follow you on the internet if you’ve visited a website), video ads, lead generation ads, carousel ads, messenger ads… etc. It’s a huge area that forward thinking authors need to understand. It will immediately give you a means of competing with your traditionally published competition who still rely upon those inefficient, expensive and badly targeted ads that are the preserve of the old publishing industry. It’s easy to publish these days. Amazon doesn’t really have any kind of quality requirements, so you could, if you so wished, publish something that was riddled with errors, with a cover you made in Microsoft Paint, and without any thought as to how you would advance your career once the first book was out there. You could do that. But the odds of finding readers and making them happy enough to buy another of your books afterwards is slim. One of the biggest mistakes I made was publishing my first book without having put it through a rigorous quality check to ensure that it was as clean and professional as I could make it. These days, I look at it like this. I am in competition with books from the traditional houses. Those books have professional covers and have been carefully edited. Those should be the minimum standards that I apply to my own work, too. Readers don’t care how the book was published, but they are obviously going to prefer books from writers with high standards (and more likely to favour those writers with subsequent purchasers). I can hear your complaint now: how can I afford to put together a team – cover design, editors, etc – that can compete with the professionals that a traditional house can deploy? The industry has contracted over the course of the last few years, and that has meant that a lot of really superb artists and editors have been made redundant and are looking for freelance work. Don’t be tempted to go to a publisher who will offer to handle all of this work for you in exchange for a fee. That’s not necessary, and, usually, the fee will be extortionate. You can do all of this yourself. There are plenty of places where you can hook up with professionals with experience in the publishing industry. There are also marketplaces like the ones hosted by Reedsy.com where you will be able to hook up with a professional who can provide the service that you need (think of it like speed-dating between authors and editors, designers, etc). The old adage is that everyone has a book in them. I can add something to that: for everyone who has a book in them, there’ll be a predator only too happy to liberate them from their money in exchange for an overpriced “service” that they don’t really need. My last Milton book cost around £1000 to put together. I am experienced enough now to be able to forego a developmental edit, but, if you want to add that to the list, you should expect to pay around the same as a copyedit. Now, saying all that, there are other ways that the cost of publication can be defrayed. You could offer to exchange something that you are good at in return for something that you need. Maybe you’re great on Photoshop, and could offer a book cover in return for someone with editorial experience carrying out a copyedit on your manuscript. There are more opportunities to make a career from your writing than there ever have been before, but that doesn’t mean that it’s easy. It isn’t. There are no shortcuts to success, either. You need to be prepared to work hard. It might take long hours and some money, too. I started self-publishing in 2012 and it was only in November 2014 that I finally felt confident enough to quit and write full-time (although I probably could have been a little braver and left earlier). I’ve made plenty of mistakes along the way, but every mistake was just a step towards finding out what works. And I’m still adapting, improving, and refining my process every single day. And my hope is that I can pass on what I’ve learned to you, so you can avoid the years of “giving up” that I had, and get ahead of the pack. 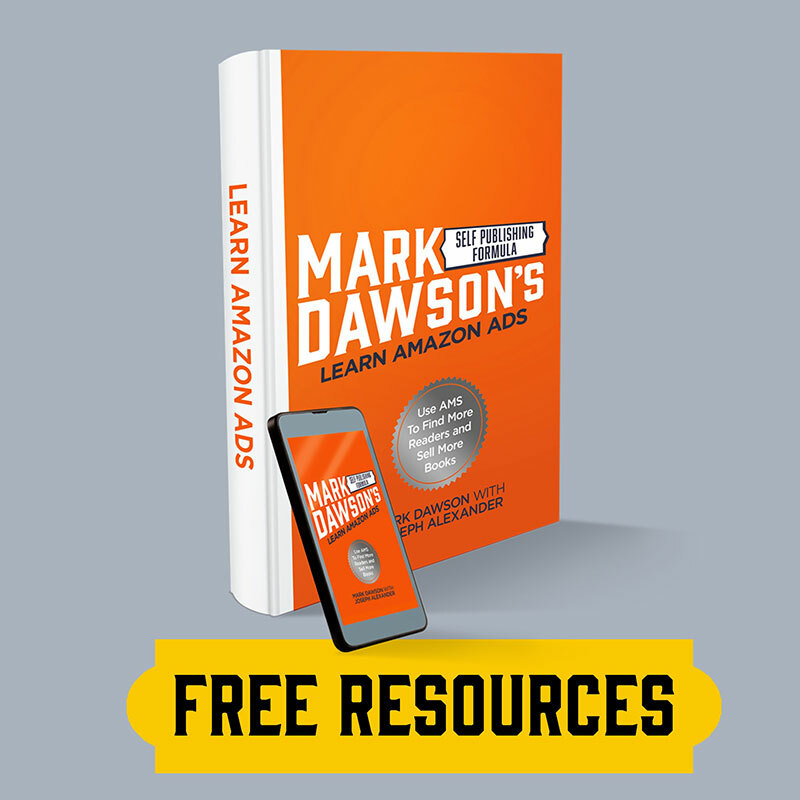 Mark Dawson is an award-nominated, multiple USA Today bestseller, with more than 20 books and over 2 million books downloaded worldwide in multiple languages. He’s been featured in Forbes, The Daily Mail, The Daily Telegraph, The Sunday Times and the Financial Times, as well as interviewed on national television and radio – and has featured in many podcasts, not least the Self Publishing Formula podcast which he co-hosts every week.